Madhya Pradesh (MP), often called as the 'Heart of India' with rich cultural heritage, hill stations, historical monuments, wealthy wildlife, pilgrimage sites, pre-historic sites (the Paleolithic era with Bhimbetka Caves), delicious cuisine, colorful festivities and multitude of cultures, promises to offer a wonderful holiday experience to every traveler. Here, we have listed many Madhya Pradesh holiday packages for you to choose from. 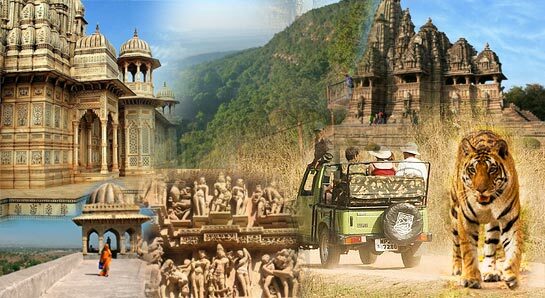 The Madhya Pradesh tour packages on goaroundtours.com are designed as per your desire and time duration is according to your choice. So, plan your next Madhya Pradesh vacation with us. Get ready to enjoy an enchanting holiday in Orcha with this 2 nights' package and explore the charming heritage and culture of this historic place. If you are a wildlife explorer and don't have much interesting thing to do on weekends, then taking this 2 nights' tour to Bandhavgarh is just perfect for you! This charming tour package offers you a great opportunity to stay in Personal caravan camps at Pachnarhi and enjoy the nature's bliss. goaroundtours.com presents this exciting holiday package for wildlife lovers travelling to Madhya Pradesh. This 4 nights' tour include visits and stay to Kanha and Bandhavgarh National Park. This 4 nights and 5 days holiday package is ideal for those who want to explore the heart of India- Madhya Pradesh. The tour covers two most beautiful and important destinations of the state, Bhopal and Pachmarhi.